I can transcribe any type of English audio (mp3, mpeg, mp4, windows media) or video(avi,Dvix). Here is what I will achieve with each transcript? Send me your audio or video today and I will get it transcribed back to you within 24 hours or sooner. For files longer than 5 minutes, contact me before ordering. All transcriptions will be done in English language only. Note: I do not transcribe songs whose lyrics are not distinct enough to be understood. If you're good to go, then give that order button a push and I will see you on the other side! 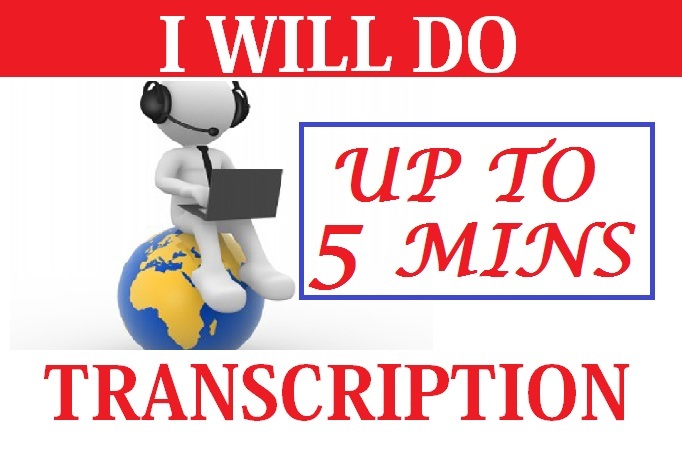 Do Transcription For Up to 5 min Audio or Video is ranked 5 out of 5. Based on 2 user reviews.